The United States of America is located in the middle of the North American continent in the Western Hemisphere with Canada to the north and the United Mexican States to the south. The USA consists of fifty individual states and one federal district, the capital, Washington DC. 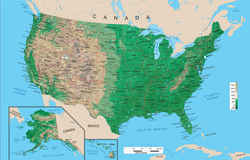 The United States ranges from the Atlantic Ocean on the nation's east coast to the Pacific Ocean bordering the west, with forty-eight of the states being contiguous, meaning connected, and also includes the state of Hawaii, a series of islands located in the Pacific Ocean, the state of Alaska located in the northwestern part of the continent above the Yukon, and numerous other holdings and territories. Many web searches are performed on the following keywords Almanac kids, Almanack, Almanacka, or Almanacks. Find images, descriptions, and a overview of the geography, topography, geographic land area, and major rivers in each state. Offers statistics and facts related to dry land, and land temporarily or partially covered by water that is defined as inland water for each of the 50 US states. Profiles the highest mountain in each of the 50 US states with a brief description, elevation, and ranking. Links to an interactive topo map of each high point.